Sharp plans an aggressive foray into the tablet market this December--well, sort of. 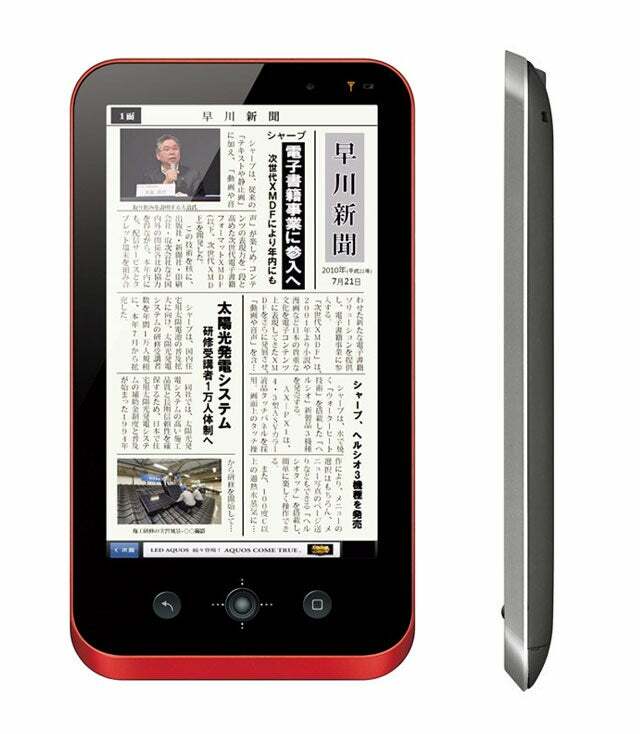 Sharp plans to launch a new online content service and two tablet devices, but it is positioning its tablets as e-readers rather than going head-to-head with tablets, and the Galapagos service and tablets will only be available in Japan--at least initially. According to the Sharp press release, "Two models of the e-book readers have been developed--a mobile type featuring a 5.5-inch LCD screen that reads like a paperback book, and a home type featuring a 10.8-inch high-resolution HD LCD that allows users to enjoy magazines formatted across a two-page spread." Sharp intends the devices primarily as a means for engaging with its Galapagos books and publications, but the Galapagos devices have a bit of an identity crisis. While Sharp considers them e-readers, the tablets use the Android mobile OS, have color displays, and will have Web browsing and social networking capabilities. Other e-readers have similar features, but the Android roots mean the devices could be capable of much more. Sharp would like the device to be perceived as an evolutionary progression of the tablet, and cloud-based content concept. The press release explains the logic behind the naming, ""Galapagos" was chosen as the name for Sharp's cloud-based media service business, as a symbol of the "evolution" of services and terminal devices that constantly bring fresh, new experiences to the user. The name comes from the famous Galapagos Islands, which were visited by Charles Darwin (1809-1882), a British geologist and biologist. The observations he made while on the islands played a key role in the formulation of his "theory of evolution"." No pricing details are available yet, but pricing is arguably the single biggest factor in whether or not the Sharp Galapagos concept succeeds. By positioning the tablets as e-readers, Sharp sets up an expectation that the devices should be competitively priced against similar devices like the Amazon Kindle--which starts at $139, or the Barnes and Noble Nook--which can be bought for $149. Undercutting the Kindle is the only sure way to draw attention, and any pricing higher than the Kindle and Nook is almost guaranteed to fail. Sharp plans to expand Galapagos beyond books to include music, movies, and games a' la Apple's iTunes. With an initial projection of 30,000 titles, though, Galapagos has a long way to go before it could compete with the virtually limitless library of titles available from Amazon or Barnes and Noble, or the content juggernaut Apple has created with iTunes. A report from Mashable claims that Sharp is negotiating with Verizon as a potential US distributor for the Galapagos tablets.